.This year we had some friends give us several boxes of very ripe black cherries--my very favorite berry! Problem was that they were already starting to go bad and we had to do something with them QUICK. Thinking through my options I decided that dried cherries would be the easiest. Except one major problem: I didn't have a dehydrator. So Nick rigged up a temporary solar dehydrator out of supplies that we had here laying around. Three cement blocks, a few lengths of 2X4's, a piece of metal roofing, a fan, and an old glass window pane. While he set it up, I quickly sorted out the good cherries, cleaned, pitted, split them in half, and spread them out on some cookie sheets. Then we put them under the glass supported by the the 2X4's. I also placed an oven thermometer inside and we left it in the sun to see how it would work. At night I would bring them back into the house and in the fridge so they wouldn't go bad, but after the first night, I left them out even at night till they were dry. During the day while the sun was shinning the temp was 150 degrees F inside the dehydrator. Simply Amazing! At the end of 4 days those cherries were a little too dry! And I had a whole quart and a half of dried cherries! They tasted really delicious on top of our cereal the next morning. I also dried comfrey root out in the sun (you can see that in the top half of the picture), however I didn't need to put those inside under the glass. They dried rather quickly just out in the open on baking sheets. Just by doing a quick search online you can find a number of different solar patterns you can use to build your solar dehydrator. 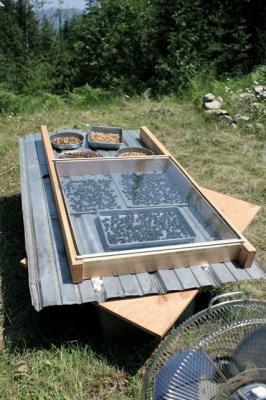 Here's an example of one that you could use as a pattern from Mother Earth News: Best-Ever Solar Food Dehydrator Plans. Sometimes we think that we are limited by our financial reasons, lack of skills, or circumstantial challenges. Put on your thinking cap and break outside of the box. Look for ideas online or immerse yourself in education. Learn more about preserving food, gardening, and homesteading. And remember, if life hands you a pile of junk, dry cherries on it!